The Ibanez JEM777 30th Anniversary Edition Electric Guitar commemorates the introduction of this ground-breaking model. 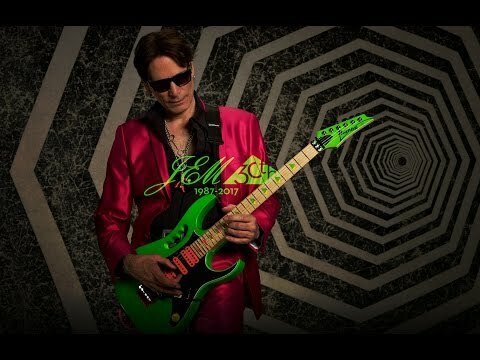 Released at the 1987 Chicago NAMM Show, the Steve Vai-designed JEM marked a major turning point in the history of Ibanez, and the development of the electric guitar. Becoming an icon to rival other models, the JEM has gone on to spawn the ever-popular RG series, which is only second to another legendary model. Staking its place in musical history, the Ibanez JEM777 is a heavenly guitar that fortunately us mere mortals can play, and with this very special 30th Anniversary model, we are truly spoilt. The body is shaped to the same ergonomically designed profile as the original. With gentle bevelled edges and curves in all the right places, this is a model that sits as sweetly during performances for maximum playing comfort. Vai was perplexed by the way other models impeded access to the upper frets, hence the deep double-cutaway that opens the fretboard in its entirety for you to explore. The body is crafted from basswood, a medium-weight tonewood that boasts a well-defined midrange energy with subtle low-end power. The highs like to sizzle before never overpower the timbre, and are never harsh on the ears. Each note is given the space it deserves, ensuring an articulate output across the frequency spectrum. The body is equipped with a pickguard to protect areas around the control knobs and the underside of the strings. Finally, we can't forget the distinctive Vai-designed 'monkey grip' located above the strings, which allows you to carry the guitar easily. The neck is shaped to the lightning fast JEM profile. Crafted from a 5-piece combination of maple and walnut, this is a virtuoso's dream, thanks to the razor thin dimensions that allow your finger to soar. If you're looking for a dream neck to play heavenly sweeps on, then this is the neck for you. A luxurious maple fingerboard is married to the neck, adorned with the truly unique disappearing pyramid inlay, guiding your way in beautiful style. The inclusion of 6105 frets guarantee exceptionally smooth string bends, whilst the Prestige fret edge treatment promises seamless transitions between frets. Not only that but delicate scalloping between the 21st and 24th frets gives unrivalled control and ease of access to the upper frets. To cover the versatile range of tones that Vai is known for producing, DiMarzio Evolution pickups are utilised in the neck, middle and bridge positions. The neck and bridge pickups are passive/ceramic humbuckers and the middle pickup is a passive/alnico single-coil. The 5-way selector switch allows you to pull a wide array of tones from this pickup compliment - from gentle soft-rock tones, tight and clean jazz lick, dense hard rock and ear-piercing metal. Simply put, if you're a session player or a guitarist who likes to mix it up, the Evos have got you covered! The JEM777 was designed with the unique Lion's Claw tremolo cavity, which allowed the Edge tremolo to wail as well as dive, lending itself perfectly to Vai's enigmatic playing style. Thanks to the tuning machine, locking nut, and Edge bridge partnership, once you are tuned up and locked in, you can rest assured that tuning integrity, intonation and sustain will remain faithful throughout the most energetic of performances. For protection on the go, a specially designed hardshell case is included to protect your pride and joy from unwanted bumps and scrapes. The Ibanez JEM777 30th Anniversary Edition Electric Guitar is supplied with Certificate of Authenticity (Tour Pass), whilst a JEM 30th Anniversary logo neck plate adds an extra special finishing touch.